This year we had some special guests. We were delighted to welcome the Chairman of B&NES Council, Loraine Morgan-Brinkhurst, just a few days after she had met with project representatives to present a Community Service Award. In this picture, Brian Vowles is showing her the photographs he took at that occasion. 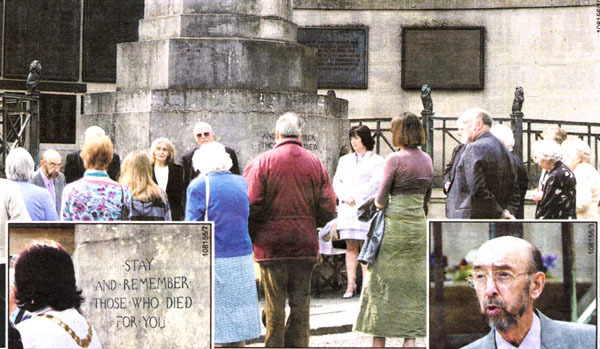 In 2003, in her role of Mayor of Bath that she held that year, Loraine Morgan-Brinkhurst had unveiled the memorial. 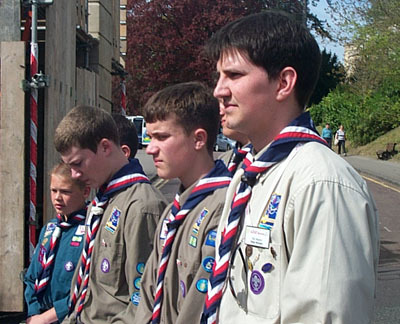 On the same day in Victoria Park there was a celebration of the Scout Movement's centenary. 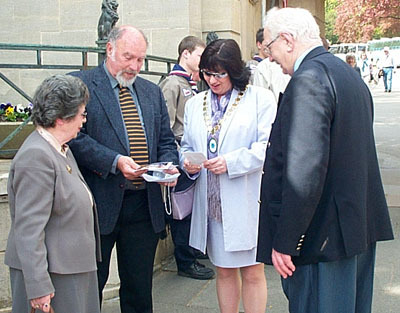 The Scouts played an active though unsung role in the Second World War, and we were delighted to include these representatives of the Scout Movement to our service. 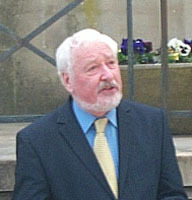 Peter Cunningham opened the ceremony with "Romance For Guitar". Welcome and Introduction, by John Penny. John reminded everybody of the reason for meeting up for this act of remembrance, and introduced the participants as he outlined the programme for the service. Kay Barrett reads "The Interruption". round the young white moon. drone of engines died away. Comes the long regret - the effort to forget. 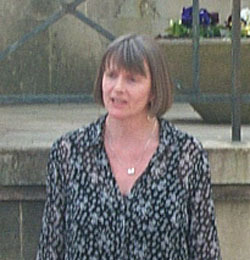 Jenny Ireland sings "Where Have All The Flowers Gone". Accompanied by Peter Cunningham on guitar. The Blessings, by Edgar Evans. "Make me a channel of your peace ..."
Then followed a period of quiet contemplation. Memories of a Survivor, by Michael Lee. Michael told of his experiences in the Bear Flat area. This was reported in the Bath Chronicle and their report can be found towards the bottom of this page. This was an extract from the memories he had previously written to the Project. The courage of Sergeant Brown, told by John Penny. John related the story of how Sergeant Brown rescued those who were trapped in the wreckage of Bear Flat. Sergeant Brown was awarded the British Empire Medal for this courageous action. This story is already on this website. 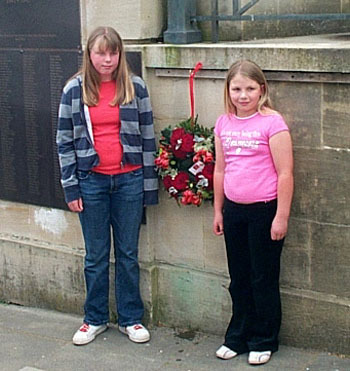 Laying the Wreath, by Kate and Emma Patch. John Penny reminded us that Mrs Edith Dando was also a heroine. As the bombs fell, she threw herself over her two daughters to protect them. This selfless act saved the lives of the girls, but Mrs Dando tragically died. Kate and Emma laid the wreath in memory of their Great Grandmother Mrs Edith Dando, who was killed by a bomb in Bloomfield Avenue. The Musical Tribute, by Peter Cunningham. Peter brought the ceremony to an end by playing "Lagrima Prelude" by Francisco Terrega. 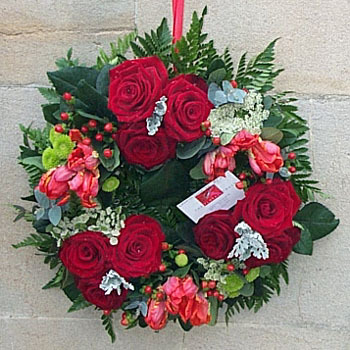 The Wreath, donated by The Floral Touch. Many thanks to The Floral Touch of 23 Wellsway (Bear Flat) for their kind donation. 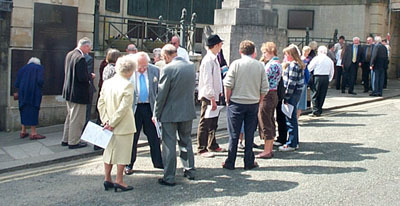 Click here for information about the plans for the 2008 ceremony. A CEREMONY of remembrance has been held for the hundreds of people who died in the Bath Blitz 65 years ago. Over two nights in April 1942, vast swathes of Bath were flattened as German bombers exacted revenge for the British destruction of the historic city of Lubeck. Yesterday saw dozens of people gather at the war memorial in Royal Victoria Park to remember the 417 people who died. A floral tribute was laid by Kate and Emma Patch, great-granddaughters of Edith Dando who was killed by a bomb as she sheltered two children in Bloomfield Avenue. Michael Lee, who was bombed out of his house in Chaucer Road, also told his story of the bombings for the first time. He said: "I have never spoken publicly about this before but if it helps people come to terms with what happened, or helps to prevent it happening again, I will be glad. The remembrance of it is not easy but it is something which was very much a part of our lives. Those nights brought the war on to our own doorstep. If I walk around the city now I can still see the bomb sites in my head." 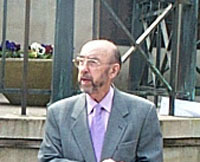 Edgar Evans, who was bombed out of his home in Holloway, led the prayers. He said: "We all thought we would be safe and that the Germans would not bomb the historic city. The planes used to come over on their way to Bristol and we were used to the sirens. But that night I could hear the bombs whistle. It was devastating. I thought it was the end for us." 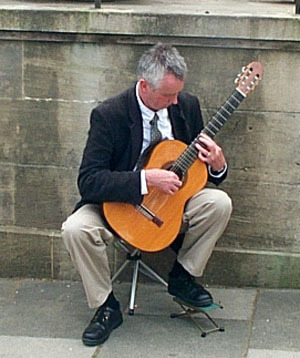 Guitarist Peter Cunningham opened and closed the service and the opening address was by author John Penny. 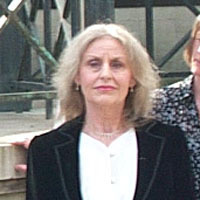 Kay Barrett read the poem "The Interruption" and Jenny Ireland sang "Where Have All The Flowers Gone?" The service also heard the story of Sergeant Brown, of the Home Guard, whose courage in rescuing those trapped in the remains of buildings in Bear Flat earned him the British Empire Medal. MICHAEL Lee was coming up to ten years old when Bath was blitzed. He said: "That Saturday I played in the garden with my pal Tom, with our model aircraft - a Hurricane and a Spitfire. Before I went to bed I did my homework - unusually - because it was more often done at the last minute on a Sunday. At some time in the night I was called from my bed by my mother. We all went down to the only place in the house which could give any shelter - the cupboard under the stairs. We had no cellar. Not only were there aircraft but there was a continuous noise - of explosions, thumps, cracks and whistling as bombs and bullets filled the air. The noise was thunderous and went on and on. I was terrified. In the morning, when it was finally quiet and daylight arrived, I wandered around and up the side road to look at the back of the house. The houses there were a heap of rubble, most of it was in our garden where I had been playing the afternoon before, and our house was torn apart. As a result of the blitz my school closed and I never did hand in my homework. The family stayed in Southstoke Road for a few nights and then moved in with Mr Lee's grandfather for five months while their house was re-built. Because his school closed, Mr Lee was accepted as an under age pupil at the City of Bath Boy's School, which is now Beechen Cliff. Mr Lee, 74, now lives with his wife Naida just a few doors away from his childhood home.